I just wanted to share with you guys my favourite shampoo ever! The brand OGX. The OGX brand have shampoo’s to suit your hair type, wether it be normal, frizzy, dry or damaged, there’s one to suit you and your needs! I am a big fan of their other scents such as coconut milk, argan oil of morocco and awapuhi ginger (this literally smells so GOOOD). I’ve used the brand OGX for a few months now and their shampoo and conditioners have never disappointed. 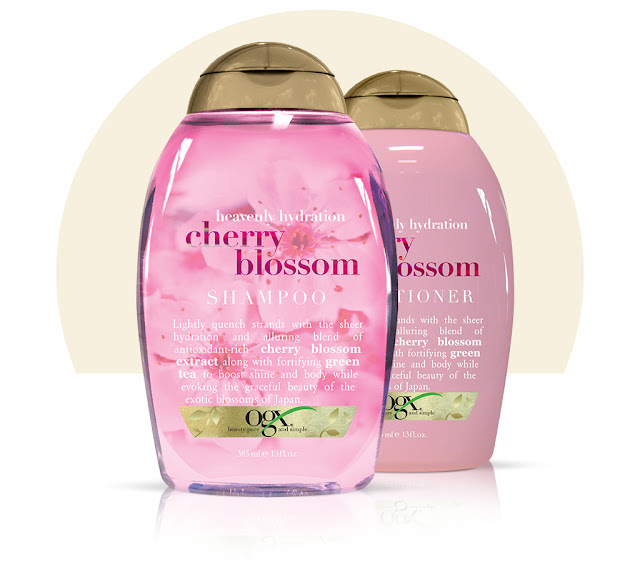 I recently bought the ‘Cherry Blossom‘ shampoo and conditioner set and absolutely love it. From the packaging to the end results, I’m a happy gal. The cherry blossom shampoo promises “Lightly quench strands with the sheer hydration and alluring blend of antioxidant-rich cherry blossom extract along with fortifying green tea to boost shine and body while evoking the graceful beauty of the exotic blossom of japan” you’re sold already right?! That and when I saw the beautiful pink packaging sitting on the shelf at the shops, I simply couldn’t resist. My hair is very long – almost at my hips! And it’s quite thick and frizzy at times so having a good conditioning/ moisturising shampoo and conditioner is a must for me. This shampoo’s texture is quite thick so a little goes a long way. When you massage the shampoo into your scalp, it froths up, leaving quite a lot of product to work with throughout your hair. The conditioner is equally thick but doesn’t froth up, obviously, so you may think that you need more product to work through your hair however when you first apply a small coin sized amount to your hair and comb it through, you can feel the product working all over the hair and your hair will become smooth and soft to touch. Using the shampoo and conditioner together gives my hair a very smooth, shiny, frizz free texture. Would I recommend this product? Absolutely. Would I buy this product again? The packaging is to die for but the product itself works and stays true to it’s promise – I certainly would buy it again!